The 2018 NFL Draft is slowly approaching as potential draft picks continue to work themselves into the plans of the 32 NFL teams. A key playmaker role on the offensive side of the ball is the tight end position. While we have seen both some solid studs over the past years’ drafts including players like Rob Gronkowski and Jimmy Graham, we have also seen players not live up to their potential like Eric Ebron or Austin Seferian-Jenkins. That said it is still a position that plays a key role week in and week out around the NFL schedule. Now as we look at a few of the top tight ends of the 2018 NFL Draft class, a few key things have changed. One of those key changes took place at the 2018 NFL Draft Combine. One name that saw his draft stock rise was tight end Dallas Goedert from South Dakota State. Goedert put up 23 reps on bench while impressing with his ability to catch the ball. With that said, here is a quick look at the Top 3 NFL Tight End Draft Prospects for 2018 NFL Draft. While Saquon Barkley stole the show at the 2018 NFL Combine, here is a player that also put on a strong performance while solidifying his draft stock. 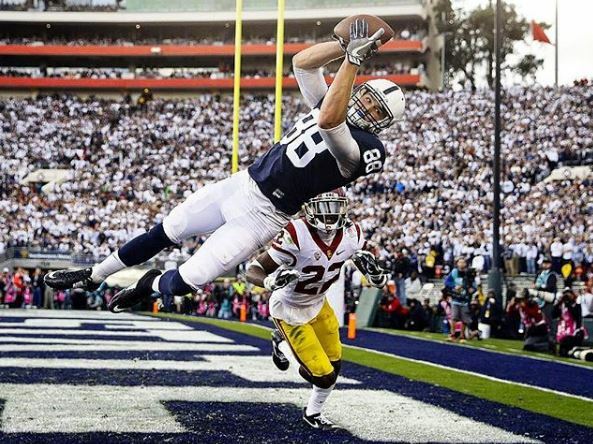 Gesicki tied for the fastest 40 time at the combine at 4.54 while posting an incredible 41.5 inch vertical. Along with that performance, Gesicki had a strong performance in 2017 pulling in 57 catches including nine of them going for touchdowns for the Nittany Lions. Potential Teams include the Baltimore Ravens, Cincinnati Bengals and the Atlanta Falcons. Playing in a high octane offense like the Sooners will lead to you being noticed by many including many of the 32 NFL teams. Andrews posted a strong 40 time (4.67) at the combine he ranked near the bottom in vertical for the position. Andrews’ highlight reel during the NCAA Football season included 958 yards on 62 catches. Potential teams include the Baltimore Ravens, New England Patriots and the Jacksonville Jaguars. Hurst might have been the only tight end that heard his name called in the first round of the 2018 NFL Draft. While that may have changed, many experts and team scouts still believe Hurst is the real deal and the top of the tight end class. While Hurst lacked the offensive numbers of some of the other tight ends, his ability to block will help him land a ton of interest on draft day. Potential teams include the New York Giants, Arizona Cardinals and the Baltimore Ravens. Other top Tight End prospects of the 2018 NFL Draft include Dalton Schultz, Jaylen Samuels and Thomas Jordan.